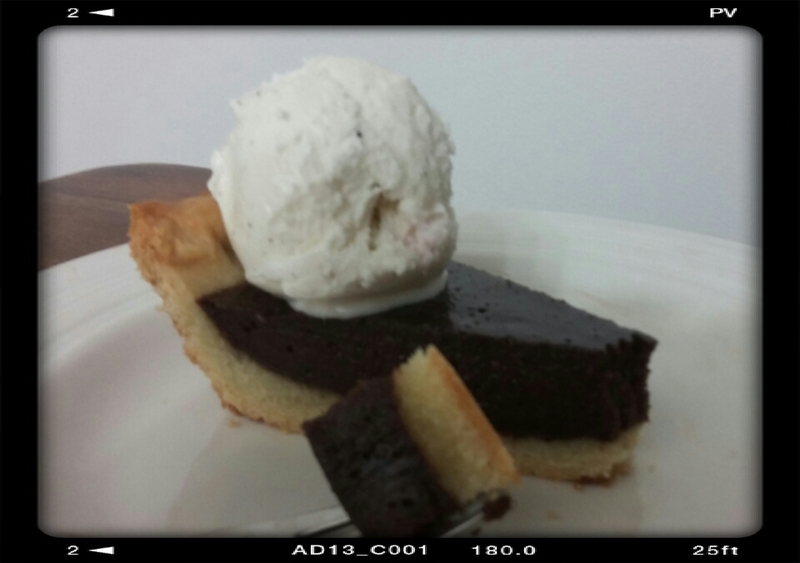 Chocolate Chestnut Pie w/ Vanilla Chestnut Syrup! Sans Chestnuts. And Syrup. Sliver o’ pie! With vanilla bean ice cream. Yummers! What do you get if you make a Chocolate Chestnut Tart, one that is made to be served with Vanilla Chestnut Syrup…but you don’t add in the chestnuts? And omit the syrup? Why, Chocolate Pie of course! Which is a lovely thing indeed! Unless that’s not actually what you’re supposed to be making. I started out making what everyone else in my online bake-a-long group was making: Dorie Greenspan’s Chocolate Chestnut Tart with Vanilla Chestnut Syrup, from her Baking Chez Moi cookbook. I looked for several weeks for packaged chestnuts, but only found regular, raw, roasting chestnuts. Eh. Good enough, sez I! So I notched them with an X, boiled them, and then peeled them. Not exactly easy to peel them, let me tell you. I got maybe 4 whole chestnuts and a lot of chestnut crumbles, but again, eh, good enough! The first step in the recipe was caramelizing the chestnuts. The idea is that one caramelizes the chestnuts that go into what is basically a chocolate pie, and then the remaining caramelized sauce (a fragrant vanilla bean and chestnut syrup) is served with the finished pie, preferably a la mode. A lot of work for a few chestnuts. I dumped the ingredients in the pan, and turned up the heat to get the mixture boiling. Since watched pots don’t boil, I sat down on the sofa and started reading a book. Either there was a rip in the time-space continuum, or I read for longer than I planned, but at one point I lifted my head out of the book and sniffed. Burning? What was burning? Oh flibbertigibbet, my chestnuts! The sauce had boiled, caramelized, and scorched, and smoke was rising from the pan. Lovely. What was I reading? I can’t even remember. Those nuts were a goner, though. 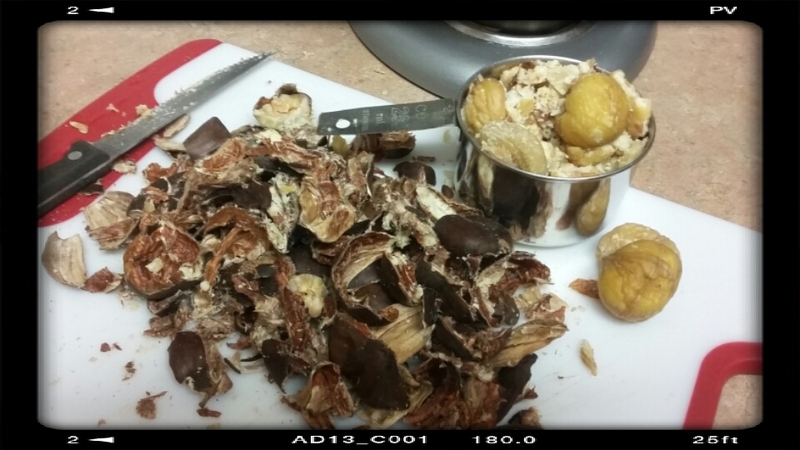 After all that work boiling and peeling the chestnuts, I didn’t have the heart to do it all over again. I also didn’t have the chestnuts. So I called it a day and went to bed. The next day (today! Technically tonight.) I tried the recipe again. I made the sweet tart crust (very shortbread like), pre-baked it, made the filling (sort of a ganache mixed with eggs), and popped the whole shebang in to the oven. Half an hour later, voila, chocolate pie! Not as fancy as what Dorie made, but just as tasty with some vanilla bean ice cream! Next Post: Chicken-Fried Tofu (no really, it’s a thing!) or chickpea-stuffed baked samosas. Something savoury to balance out the holiday sweet overload. Not that that’s a bad thing! This entry was posted in Cook-a-Longs R Us on December 30, 2015 by Margaret. There’s nothing quite like the scent of gingerbread drifting from a kitchen, to make it feel like the Christmas holidays have finally arrived. While I do have a gingerbread recipe handed down to me from my mother, it is sometimes a bit more work than I care to do. In which case, these super-quick and easy ginger cookies from Canadian Living magazine are spot on! So that’s what today’s Memories of Meals Past post is about: Ginger Molasses Crinkle Cookies! Except that I added a pinterest touch — holly decorations piped onto the cookies in melted chocolate. 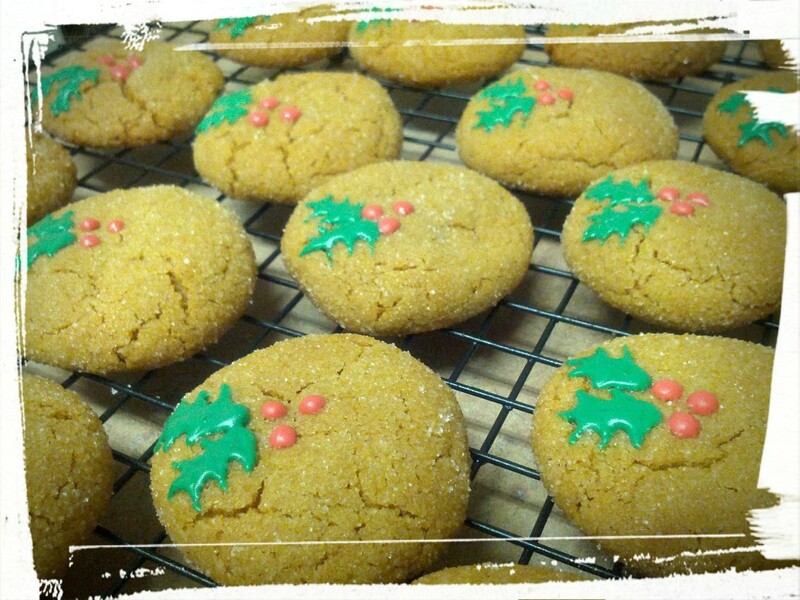 Hence my new name for them, Holly Jolly Ginger Cookies! Want to make some yourself? Here’s the recipe. As for the decorations, they’re surprisingly simple to make. Melt some red chocolate wafers and place in a plastic baggie. Do the same for some green chocolate wafers. Snip the teensiest bit of one end of each baggie, so that you have created a ghetto pastry bag! On each cookie, draw two lines in green chocolate, almost like a V, but without them touching at the bottom. Then, while the chocolate hasn’t set yet, use a toothpick on ONE of your green lines (i.e. half of the V) and drag out three points from the left of the green line and three points from the right of the green line. You’ll end up with a holly leaf. Do the same for the other half of the V (i.e. the other green line on the cookie). Finally, dot three dots of melted red wafers just below the two holly leaves. And voila, Holly Jolly Cookies! Enjoy! Next Post: Oh the delicious things I have to make! Or have made and just need to post about. Garam Masala Chickpea Filled Samosas vs. Chestnut & Chocolate Tart. How can I choose? Linking Up at Meal Plan Monday! And…a year later, again! This entry was posted in Cookies on December 27, 2015 by Margaret. Deliciousness, thy name is sugar + butter! I love the holidays, especially Christmas! I love baking delicious things, including rum-basted Christmas cake; I love decorating my home with hand-stitched Christmas quilt and homemade ornaments; I love putting out stockings and filling them up with little treats; and I love celebrating with everyone that I hold dear all in the same place. Of course, all this fun stuff is also a lot of work. Which means there’s no time for slacking off, and definitely no time to be lying in bed with a respiratory infection, coughing as though I’m doing an impression of a barking seal (or as the DH says, a little elephant). And yet, that’s what I was doing these past few days, which is why I couldn’t bake for the DH’s office Christmas party, or finish my holiday baking, or indeed do anything except drink hot liquids and rest. But I still have a recipe for you! (Am I not an awesome food blogger? BTW, the only correct answer here is yes.) 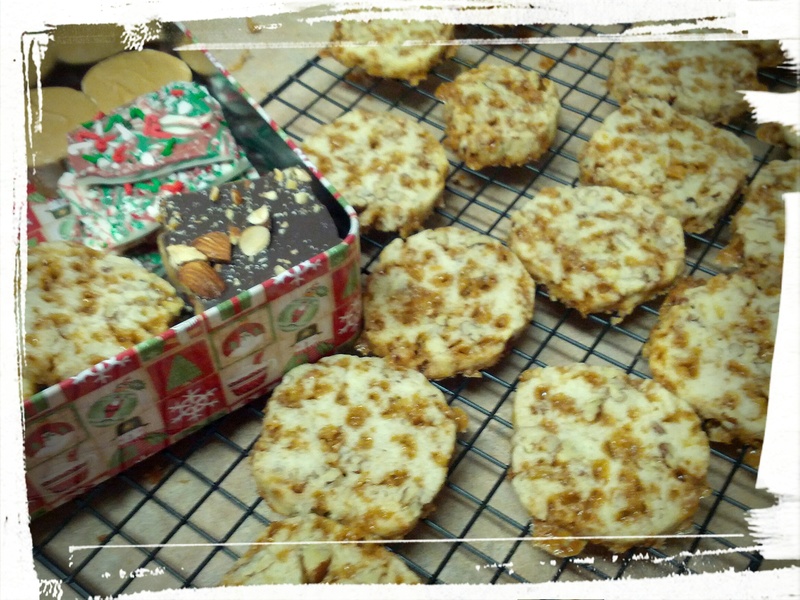 Last week I made some Toffee Pecan Refrigerator cookies to put in some Christmas cookie tins for friends as well as for a get-together I hosted with some friends. They’re cram-packed full of toffee bits and chopped pecans, and if they were dipped in chocolate, would taste a bit like a toblerone bar. Oooh, brilliant thought — why not sandwich them together with chocolate ganache? *drools on computer* Want to make some? Toast the pecans until they smell fragrant, then cool and chop them up. Mix the sugar, butter, and egg until fluffy. Add in vanilla extract. Mix the flour, baking powder, and salt together and add to the butter/sugar/egg mixture. Stir in the toffee bits and pecans. 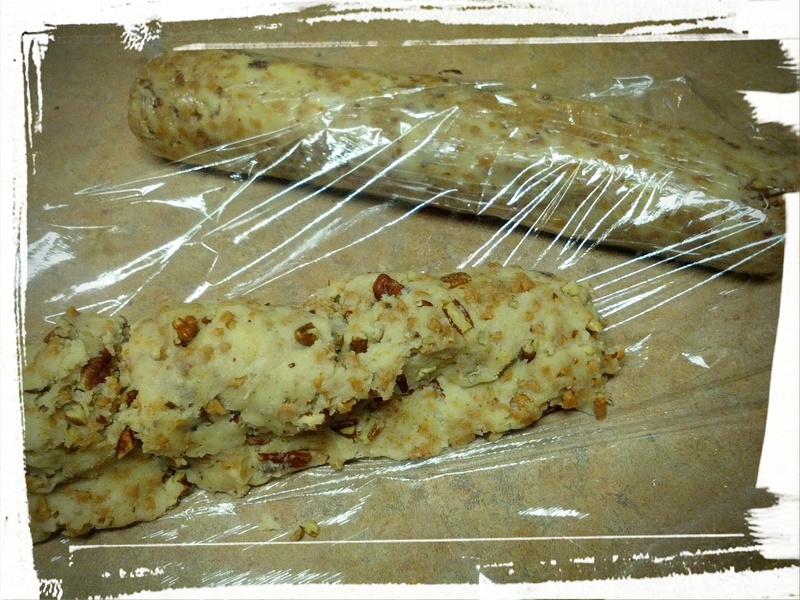 Roll into 2 logs, wrap in plastic wrap, and chill in fridge for 1 hour to several days. Remove wrap, slice into 1/4 inch rounds, and place on a greased cookie tray or silicone mat-covered tray. Bake at 350 degrees until golden on the bottom, 10-15 minutes. You will notice the toffee bits will bubble, so keep an eye on them so that they don’t burn. Cool, and enjoy! You can also freeze the dough when it’s in log form, and then defrost, slice, and bake. Easiness! And on that note, back to bed for me. Enjoy your holiday season, everyone! Next Post: I’ve got a back-up of delicious things to show you once I’m feeling better: Garam Masala Chickpea samosas, baked spring rolls, and of course, delicious sweets! Stay tuned! Linking up at Meal Plan Monday! And again! And at the Cookie Edition of Meal Plan Monday! This entry was posted in Cookies on December 23, 2015 by Margaret. On the left, the first try. On the right, the best of the rest. In the middle, an attempt to make the cookie Dorie describes. Usually I post my bake-a-long recipes on Monday night or Tuesday evening at the latest, but this week’s recipe got away from me, so I’m posting it on a Wednesday. 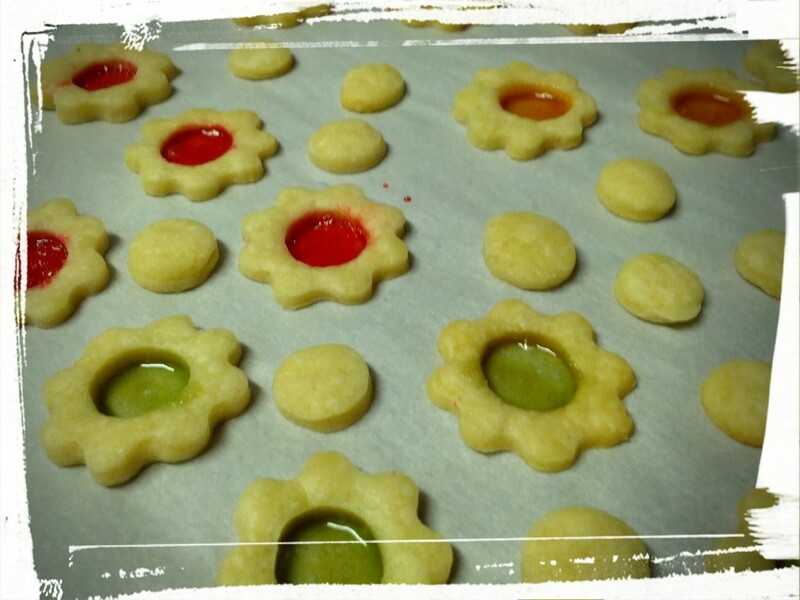 The recipe is Stained Glass Cookies from Dorie Greenspan’s Baking Chez Moi — doesn’t it sound nice? It didn’t sound like a complicated recipe when reading it. 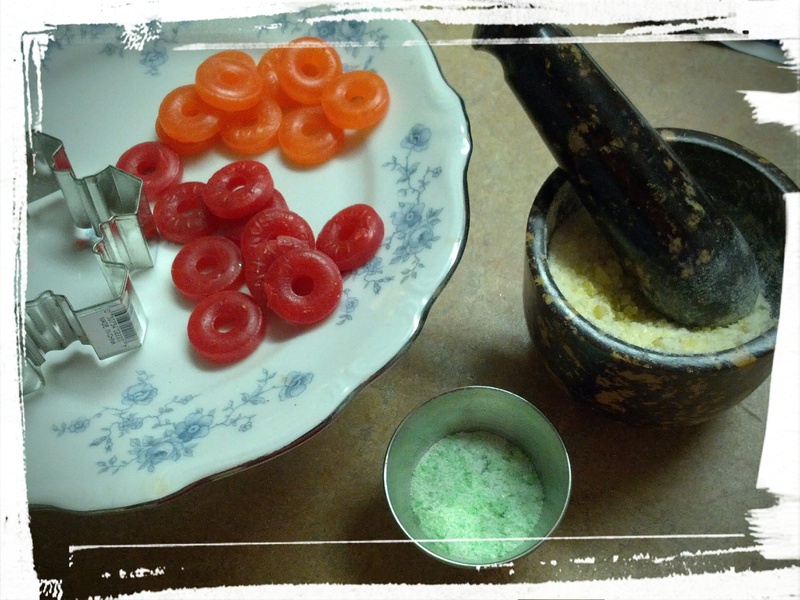 One uses a basic dough, then cuts out an shape and an inner shape, and fills the inner shape with crushed hard candy. 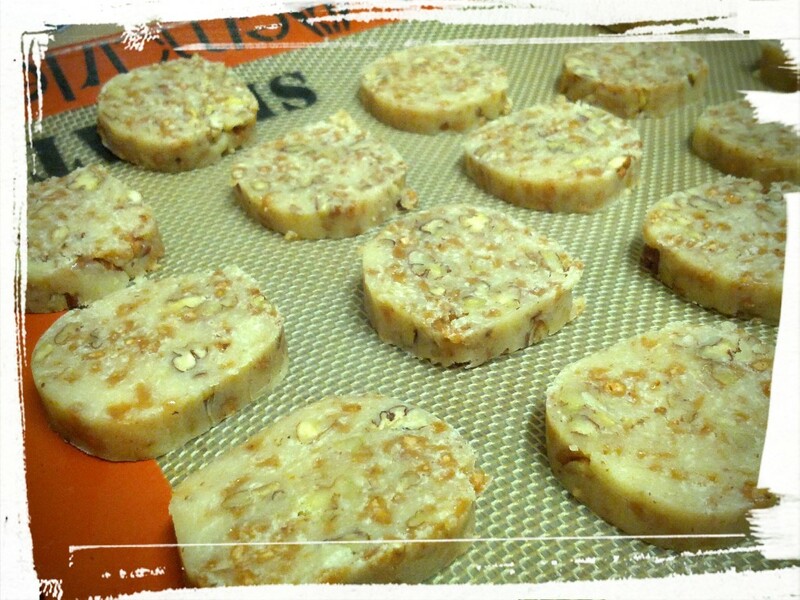 Dorie writes that you should stick the dough in the freezer for an hour before cutting out the shapes. Eh. Usually when Dorie says to chill a dough in the fridge, I stick it in the freezer to cut down on chilling time. So you know what my reaction to chilling dough for an hour in the freezer will be, don’t you? So I just stuck the dough in the freezer until firm. Hey, almost perfect is good enough, amirite? I worked for over three hours on this recipe, crushing the candies, rolling out the dough, sticking the dough in the freezer, cutting out the shapes, sprinkling the candy in the cookies, sprinkling sugar on the cookies, rolling out the scraps, rinsing and repeating. So pretty. Also pretty much a pain to make. Ugh. They’re pretty, I suppose, and kind of tasty, but the headache of trying to figure out the right combination of parts was a pain in the patootie. I actually have a literal pain in my neck from making these finicky cookies. I AIN’T GOT TIME FOR IT! Next Post: I developed a delicious cucumber salad with Asian flavours recently, so maybe that. Or maybe finally the grind-your-own Garam Masala spice that I keep teasing y’all with! 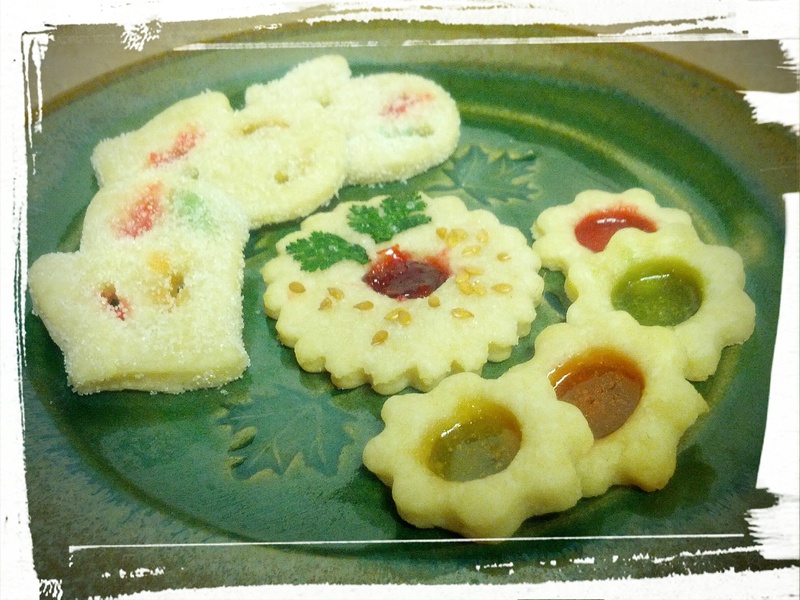 This entry was posted in Cook-a-Longs R Us, Cookies on December 10, 2015 by Margaret. Nutrition, but sneaky about it. Tastes better than you’d think! Also, forgive the poor lighting — I took it at work with a cat on my lap. When I was a child, fast food chains often sold a three-bean salad alongside their deep-fried meat products. One could buy little containers of three-bean salad alongside one’s chicken thighs, most likely to assuage nutrition guilt (“I’ll take a bucket of deep-fried chicken, annnnnd a two-bite container of bean salad. That’s a balanced meal, right?”). For those used to the creamy little bites of coleslaw that are now ubiquitous, let me just say that three-bean salad is even better! It looks disgustingly healthy…but it’s surprisingly delicious! No, really, it’s capital T Tasty! But the magic is in the dressing. You need to mix up a bit of sweet with the sour, some sugar with the vinegar. The latest recipe that I’ve tried gets it pretty much perfect! This recipe calls for cider vinegar with some sugar, and it really gets that puckering taste right in the ol’…pucker? I had just run out of white sugar, so I used some brown sugar (hey, I’m the queen of substitutions, am I not?) and it was perfect! Next Post: I’m thinking oven-baked spring rolls. Or…the grind-your-own Garam Masala? Eh, eh? 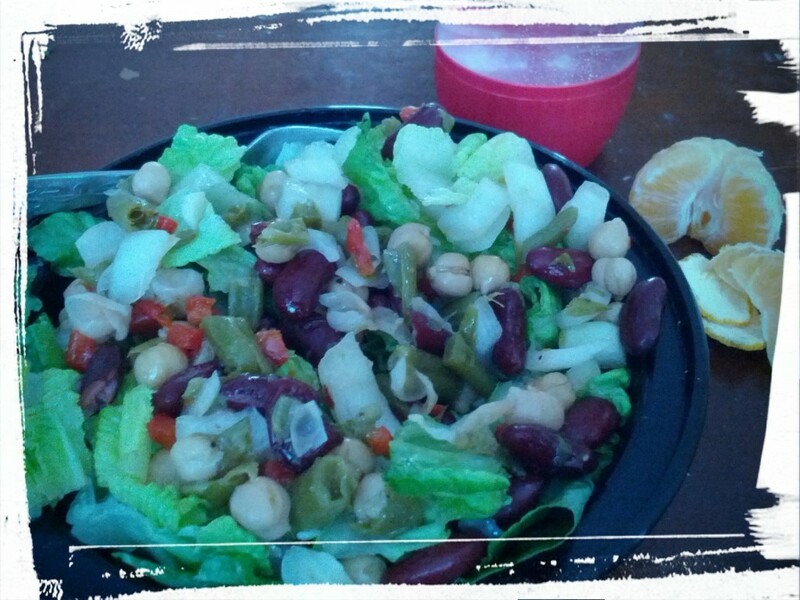 This entry was posted in Salads I Have Known and Loved on December 1, 2015 by Margaret.